MAMbo offers to all its visitors the possibility to live the museum experience with the maximum freedom. In effect it is possible for anyone to enjoy the exhibition itinerary and to benefit from the services offered by the museum, included those thought for a more selected public. 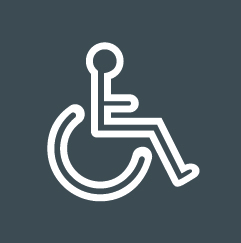 It is available for free a wheelchair to enable those who have deambulation problems to visit the exhibitions more easily. The wheelchair can be asked at the museum reception.